The Kgalagadi Transfrontier Park has a rich history steeped amidst the rolling sand dunes and dry riverbeds. With an area of over 3,6 million hectares, it is considered to be one of the largest conservation areas in the world. 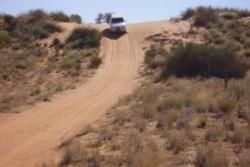 The Kalahari impresses with red sand dunes, golden grasses and herds of animals thriving in a seemingly waterless land. The two main rivers cutting through the area are the Nossob, which means "dark clay", and the Auob, which means "bitter water". The park is undoubtedly one of the most beautiful to visit and stretches over the borders of neighboring Botswana and South Africa. Formerly known as the Kalahari Gemsbok National Park, its history is one of intrigue and survival. In 1914 the world was ablaze with the outbreak of WWI. In order to gain a foothold in the German occupied South West Africa, now Namibia, South African troops drilled various boreholes along the river banks in search of water. Local community members acted as guards to protect the boreholes. After WWI, the region was divided up into farming land by Rodger "Malkop" Jackson and their occupation was encouraged, due to the harsh climate however, farming was soon abandoned for hunting, causing great destruction to wildlife populations. In 1931 Minister of Lands Piet Grobler decreed the area a national park. The first warden was Johannes Le Riche who patrolled the area on horseback with assistant Gert Januarie. A malaria outbreak occurred in 1934 after the park received unusually high rainfalls, claiming the lives of both men. Johannes’ son Joep, who was initially a temporary solution, stayed for 36 years. Due to the dedication of these men the wildlife numbers gradually improved and with the additions of areas across the borders of Botswana and South Africa, a free roaming, protected area was established in 1992 in which wildlife now thrives. Herds of oryx and springbok roam the plains with the renowned Kalahari black-maned lions ever watchful. The park paints breathtaking scenic canvasses and hosts a myriad of wildlife, bird species and incredibly adapted flora. Roads are not suited for smaller type vehicles and a minimum stay of 2 nights are required when crossing through the park into neighboring countries.